Jody is pretty tough for a sixteen-year-old girl. That’s the only reason she’s still alive -- for now. She was sleeping over at her friend Evelyn’s house when a group of killers broke in and tried to slaughter everyone. She saw Evelyn spitted on a spear, but Jody managed to escape, along with Evelyn’s little brother, Andy. Simon was one of the killers that gruesome night. His friends have left it up to him to find the only living witnesses to their massacre. Or else they’ll butcher his family next. But Simon has his own reasons for wanting to get his hands on Jody. 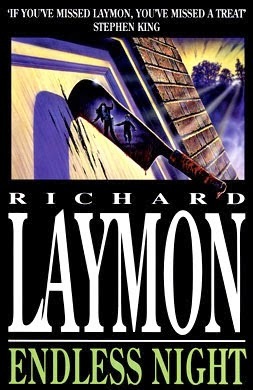 When I first read Laymon, I admit to being a little disappointed. I mean, with the praise this writer has received, you would figure he was one of the ‘gods of horror.’ I didn’t see it on the first sampling, but after this one, I’m definitely more tempted to join the Laymon cult in the near future! This particular plot involves two well-written youths, Jody and young Andy, who are lucky enough to escape from one of the worst deranged and blood thirsty killing clans this side of the planet. I mean, these guys are nutty folks at their worst! From the first page (A sudden noise announcing impending and violent doom) to the final page (a shocking and heart wrenching discovery), I was enraptured from the get go! Laymon whips up a creepy, dark, bleak, somewhat light spirited (and at times humorous) dessert. Jody is a strong, maturely developed, and capable young lady who leads the pack with intellect, highly tuned survival instinct, and a sense of humor to boot. Andy is an adorable little lad who has been through way too much for one lifetime; I definitely felt a strong connection here. Jody’s father is an interesting sort that I learned more from through Jody’s eyes, his off the handle mannerisms, and obvious love for his daughter. While the limelight doesn’t shine on him non stop, I still got a strong sense of him early on and attached myself like a leech. All villains are enough to induce chills and remind you to lock the house at night. The pacing is pretty speedy. Mucho happens from day one (or I should say night) and the ride doesn’t do many stops from there. It slows down at peak moments to let the tension begin building again, but overall its full of thrills and excitements around every corner, every bump, and every carefully crafted maneuver. Laymon’s style suffered slightly with Body Rides (in my mind anyway) but here he concentrates completely on plot and character. He holds the hand of the reader and makes sure they stay – only to let go and handcuff them when things get a bit more rocky. If you want to jump into Laymon, make Endless Night your intended spot. Well written, tight, and sharper than those needles you hated getting poked with when you were at the doctor’s office as a wee one, this one is a keeper! Read it once, read it again, and then lock it away for safe keeping.